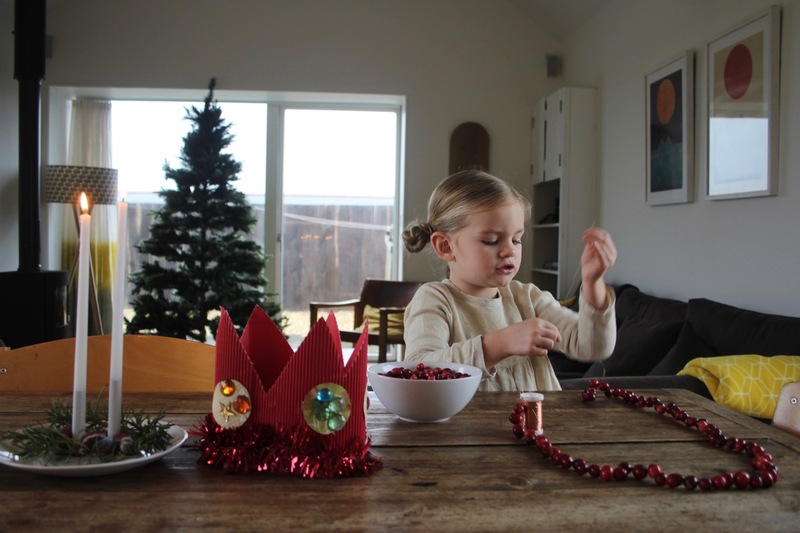 Growing up, we always made cranberry garlands for our Christmas tree at home, and after posting a photo of my daughter making them last year on Instagram, I was surprised to realise it is not common in Europe! People loved the idea, and kept asking me how to do it, so I thought I would share a few little tips that I take for granted. In the US, cranberry bogs are more abundant, hence the lack of cranberry garlands in Europe. Cranberries and fruit in general were popular in decorating trees since Christmas trees were introduced into homes. 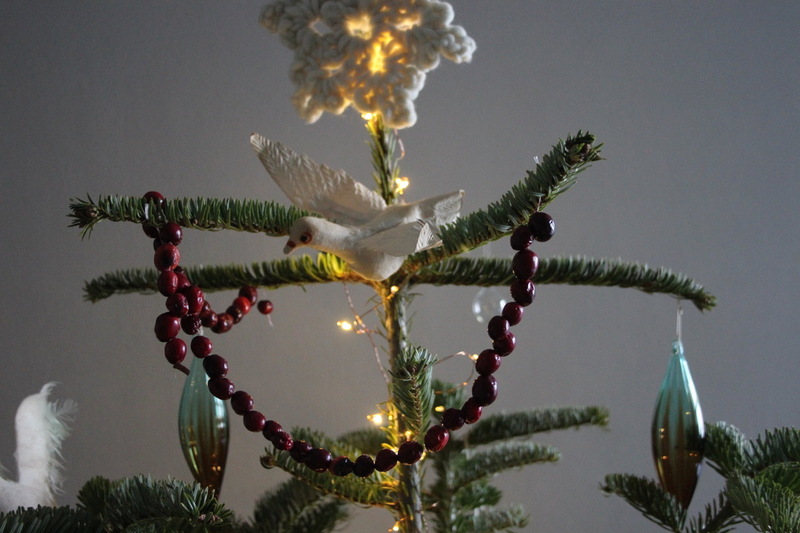 We often made our garlands with popcorn and cranberries, which creates a mixed garland of snowy, fluffy, and bright whites, juxtaposed with the shiny and brilliant cranberry-red balls. 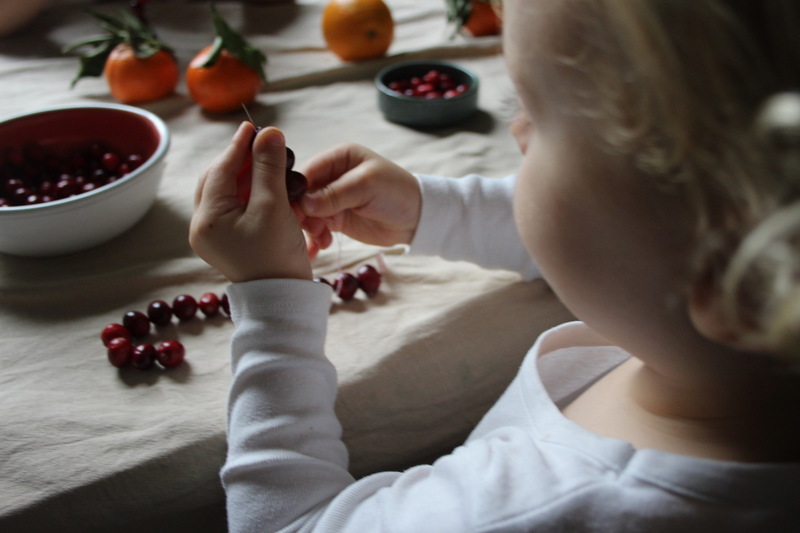 But I find that just cranberries are much easier to string with little ones. (Popcorn falls apart, and crumbles — if you don’t eat all of it first!) And I prefer the end result of fresh cranberries as they dry too! Use thread, fishing line, or even waxed (unscented) dental floss, and a needle with an eye large enough to fit it through. 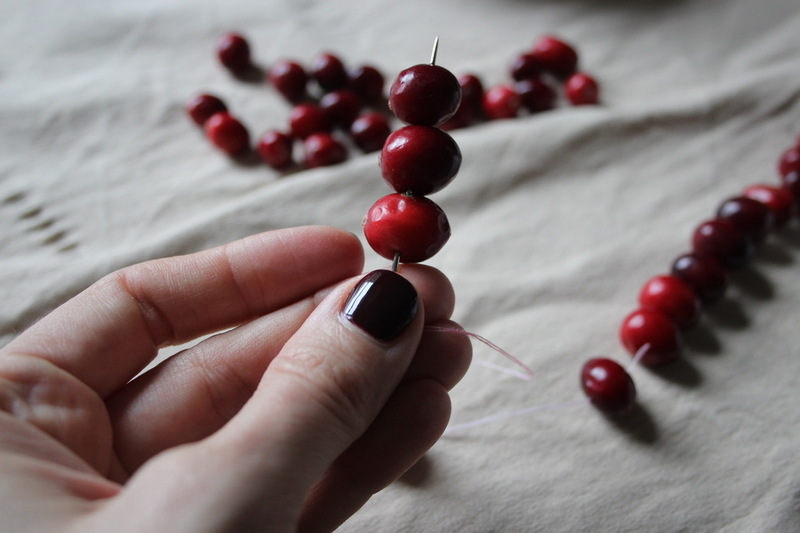 Tie a knot around the end cranberry, and string away, putting the needle through the centre. Only string the fresh, plump berries. Continue until your garland is as long as you’d like. Yes, little hands (like Joseph’s 2-year-old ones) can get poked with the needle but they get the idea, and it usually only happens once! He loves doing it, as does his big sister. Outdoors these also look great on trees! 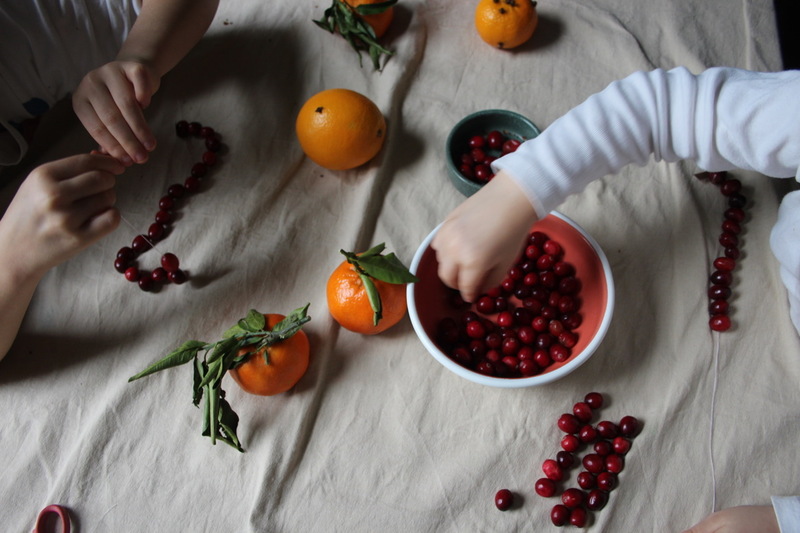 Next year I might even be tempted to make an all natural tree with cranberry garland, my orange and clove pomanders, pinecones, dried orange slices, and cinnamon stick bunches. Any other all natural recommendations you can add to my list?… please do! We love these leaf garlands and handmade bunting and baby bunting to decorate homes too! For a different purpose of course. These look great! I would like to try these next year. I love natural Christmas decorations! In the Autumn we collected conkers to thread and make garlands with. They would be a bit heavy for the tree but looked lovely draped around the fireplace or down the banister rail along with other natural decorations like green foliage and pine cones. I use them in different ways to decorate the house from Autumn onwards. We needed a bradawl to pierce the hole through the conkers first and found extra long boot laces were good to thread them onto as they have the harder bit at the end to push through. No needles needed.